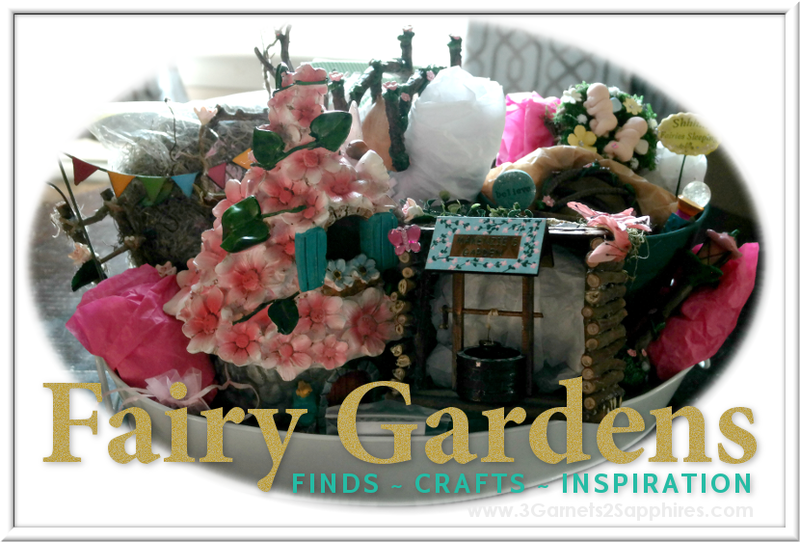 This post was sponsored by Oriental Trading Company, where the possibilities for DIY and home decor projects are infinite. We live in a small townhouse, and are often challenged by the lack of space we have for five people (and all their belongings) to live comfortably. One of the first rules of living in a small space is to maximize usage of the walls. I was pretty happy when we put up two rows of hooks on the wall by our backdoor. Then after awhile, I started to think about how we could make this wall even better . . .
Two rows of coat hooks plus a shoe bench. A bench stuffed with the shoes belonging to two tweens and one teen. There were three main things that were not ideal about our setup. 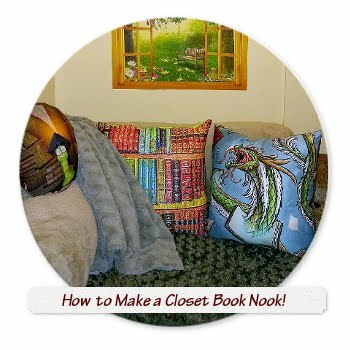 1) The coats were spread out between two rows of hooks, and not every hook was being used. 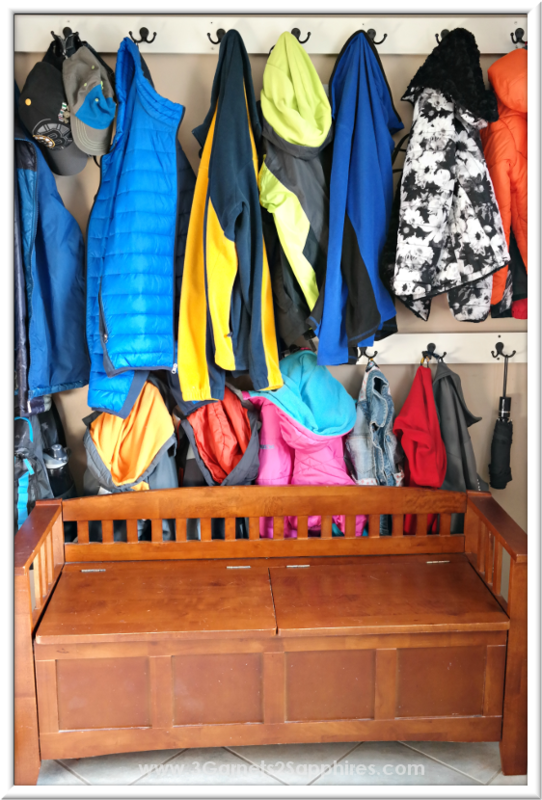 2) Depending on how many pairs of shoes or boots our children owned at the time, there were times when the shoe bench was too full to close the lid properly. (Also, the shoes were getting dirty from being thrown on top of each other. I think that bothered me more than the children though.) 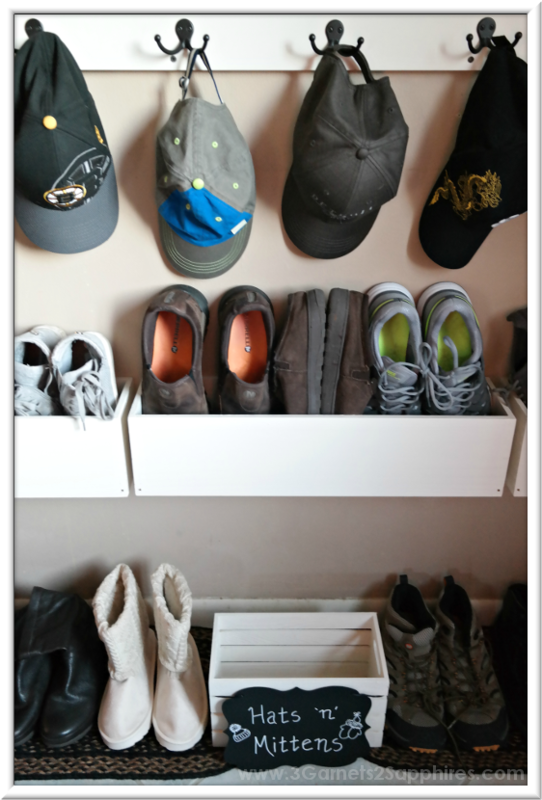 3) There was no room for my husband's shoes, so he would leave his shoes strewn about the first floor of our house. Step 1. Decide how many flower boxes you need for your space. The ones we used measure 24" x 6" x 6". 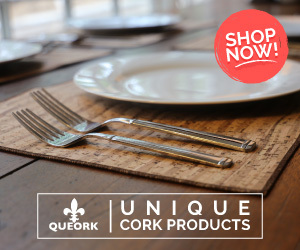 You can configure them in multiple rows to fit your space. We used one row of three across. 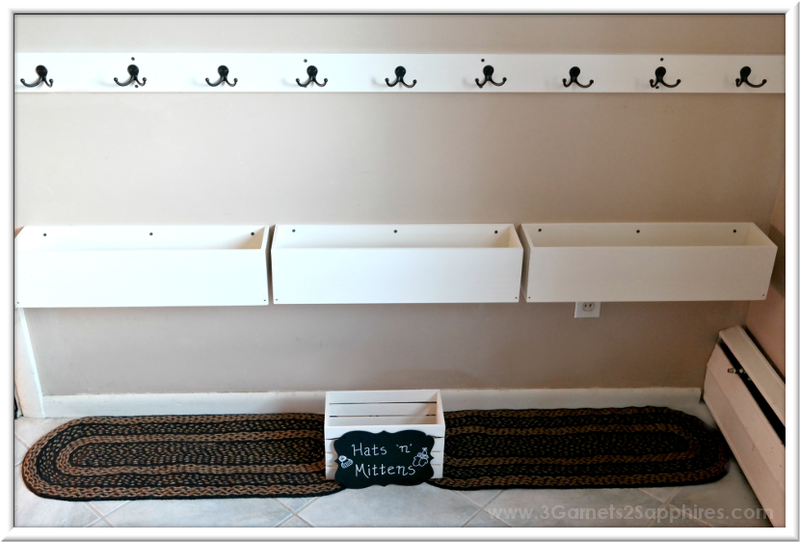 You can make this project fit almost anywhere, from a mudroom to a closet. Step 2. 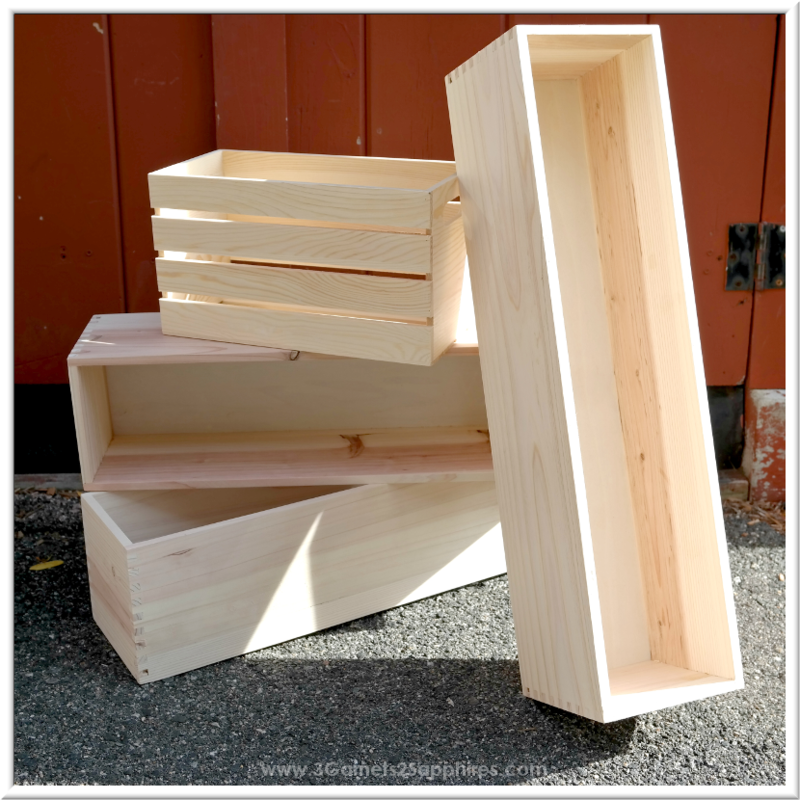 Add one coat of paint on your unfinished flower boxes and crate. Add up to two more coats of paint, making sure the previous coat is completely dry before adding the next. Step 3. Lightly mark on the wall where you'd like your flower boxes to be positioned with a pencil. Use your measuring tape to ensure each box will be the same distance from the floor. Step 5. 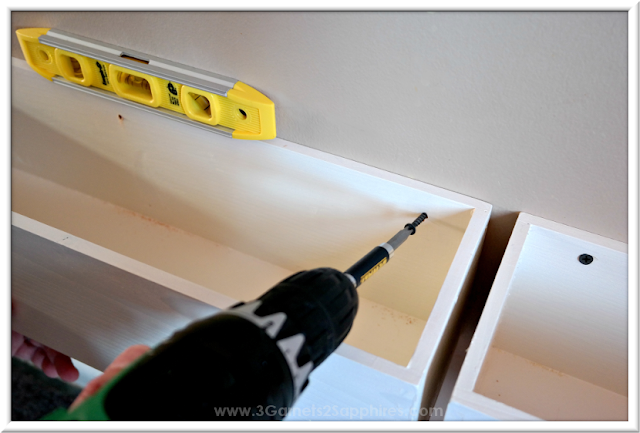 With the help of your level and the marks you've made on your wall, secure the flower boxes to the wall by screwing the 2" drywall screws through the pre-drilled holes and into the wall. Step 6. Place woven table runners on the floor along the wall under the flower boxes to have a place for boots or wet shoes. Step 7. 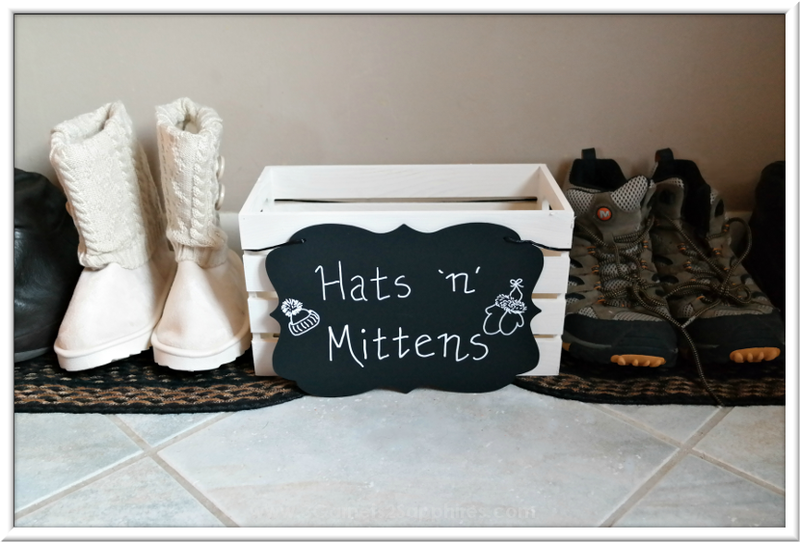 Add a crate to hold wet hats and mittens. 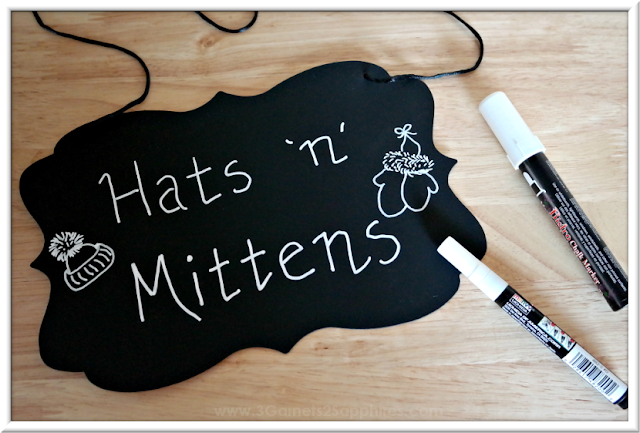 You can create a sign easily using a chalkboard sign and chalk markers. I made two! One for hats and mittens in the winter, and a second sign for flip-flops in the summer. 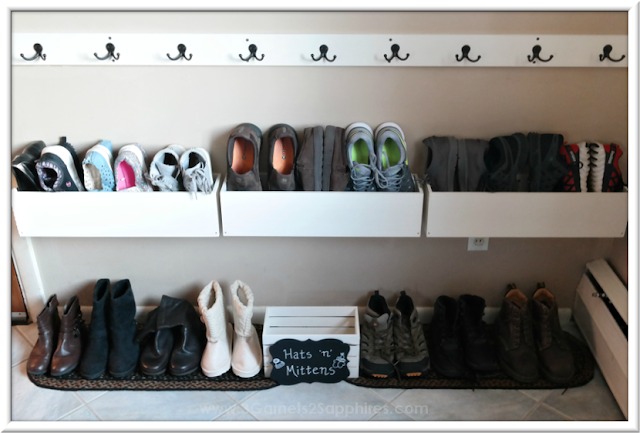 Our whole family agreed that the new Wall-Mounted Shoe Organizer worked out great. 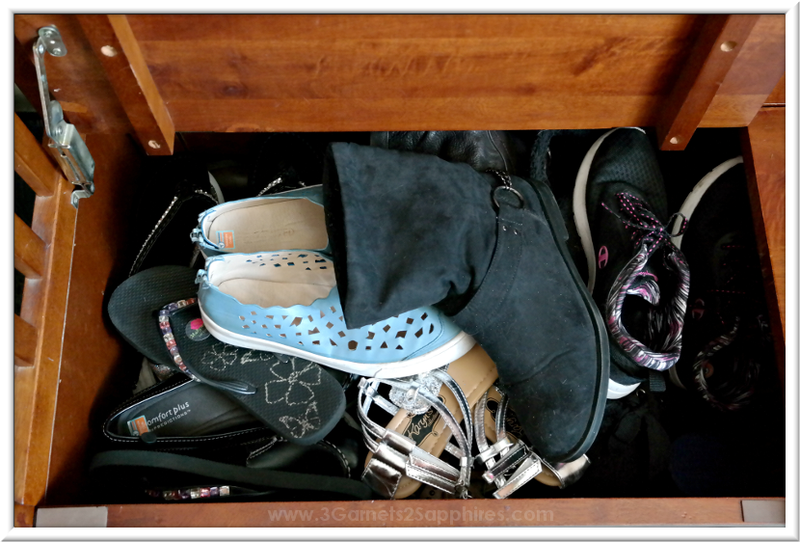 Our children could see all their shoes easily and never had to search for the second shoe. My daughter could fit most of her shoes sole-to-sole, but put her high-top sneakers side-by-side. Look! 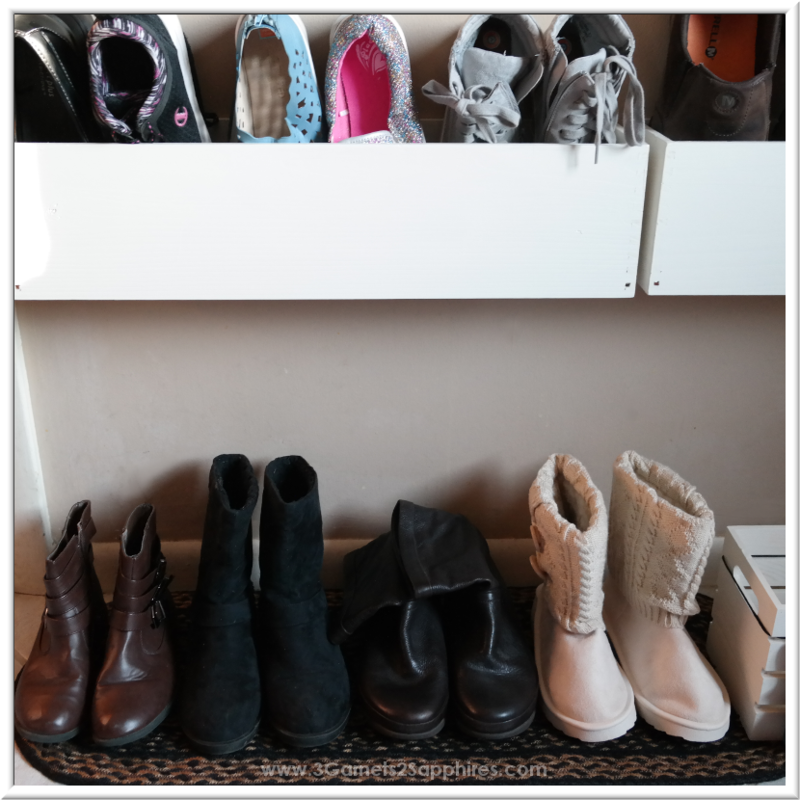 There was enough room for my 3 children's shoes AND my husband's shoes. 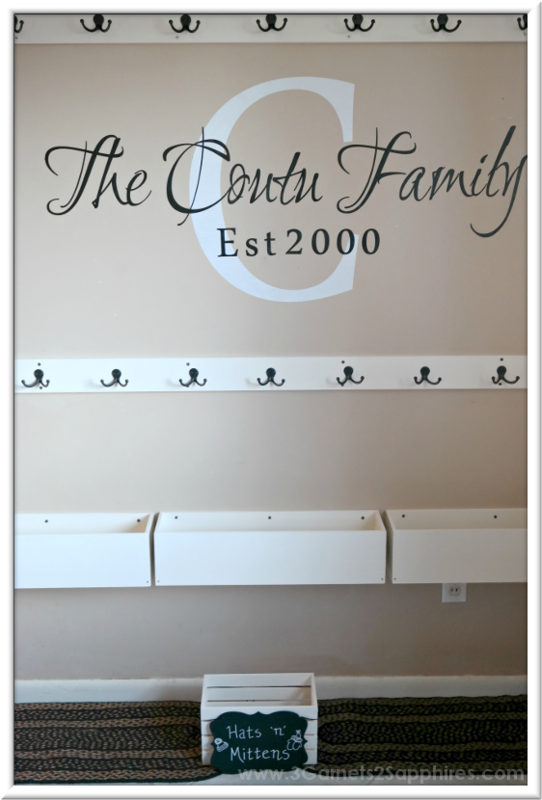 If we could have, we would have mounted the flower boxes a few inches lower so our children could hang their backpacks on the row of hooks right above them, but we did not want to cover the existing electrical outlet. Instead, we are using those hooks for hats, umbrellas, and dog leashes. All their coats fit on the top row of hooks because we are now using every hook. 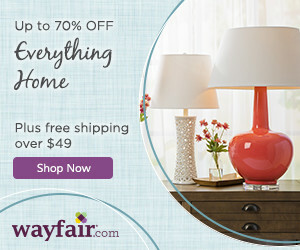 Like this DIY project? Pin it for later . . .
What would you want to change about your coat and shoe area? 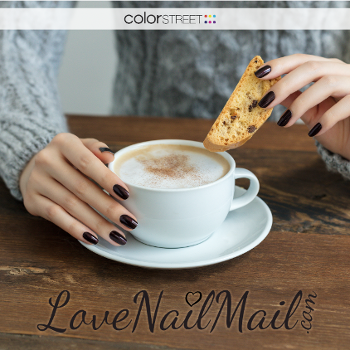 Tell us in a comment here!